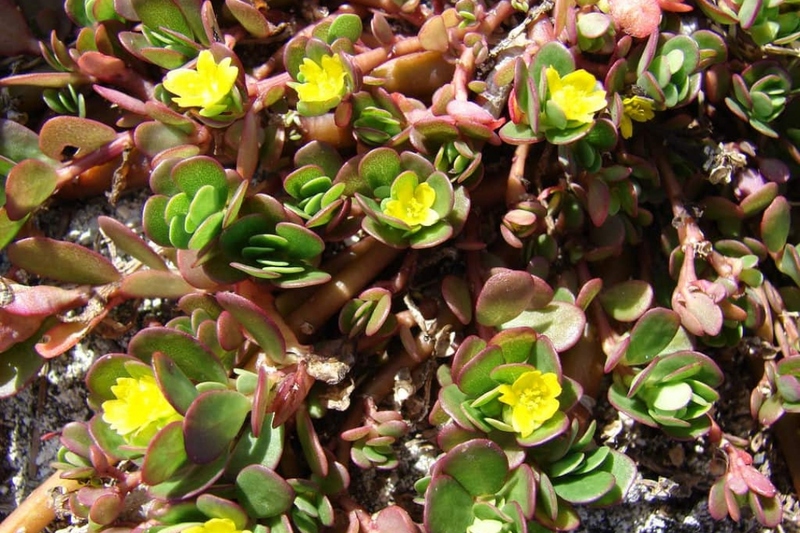 Purslane (Portulaca oleracea): growing, planting, caring. Common purslane is a cute - and edible ! - succulent plant. Portulaca oleracea - common purslane, also known as verdolaga, red root, or pursley - is an annual succulent in the family Portulacaceae, which may reach 40 centimetres (16 in) in height. Although William Cobbett noted that it was "eaten by Frenchmen and pigs when they can get nothing else » - non-ornemental varieties are perfectly edible - and taste nice ! Sow in the vegetable garden in sandy and sunny soil in open soil from April to July. Work the soil finely on the surface, leaving no clods, finishing with a scratching and a delicate raking. Mix the seeds with sand and sow sparsely. Sprinkle gently with the watering can or better, with the sprayer, without creating a swirl that would take away the seeds. At the time of emergence a few days after sowing, watch for slugs that can swallow all in one visit. Water regularly after sowing - twice a week in fine mist - and then in case of drought during all summer. Harvest according to your needs, cutting them to ground level. Remember that the stems become tough if you leave them too long.